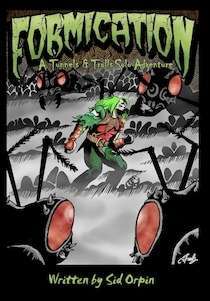 Formication is a mini solitaire adventure for use with the Tunnels & Trolls™ role-playing system created by Ken St.Andre. It has been designed for use with version 7.5 of the rules but could easily be adapted for use with earlier editions. You are a newly commissioned officer in the Royal Guard of the fairy kingdom of Cerinor. Captured by your sworn enemy,the batkin hordes of the Marble Mountains, you have been sent into a nest of giant fire ants to retrieve ant larvae for the delectation of the batkin hierarchy. Can you survive in the claustrophobic confines of the ant colony long enough to be able to attempt to escape or will the creatures of entomological nightmare within put an end to your adventures for good? This adventure is designed for a newly created fairy warrior of 1st or 2nd level.